Some of Buzz's stained glass sculpture. structure. The lamp was then electrified. Chico stands 28 inches tall. 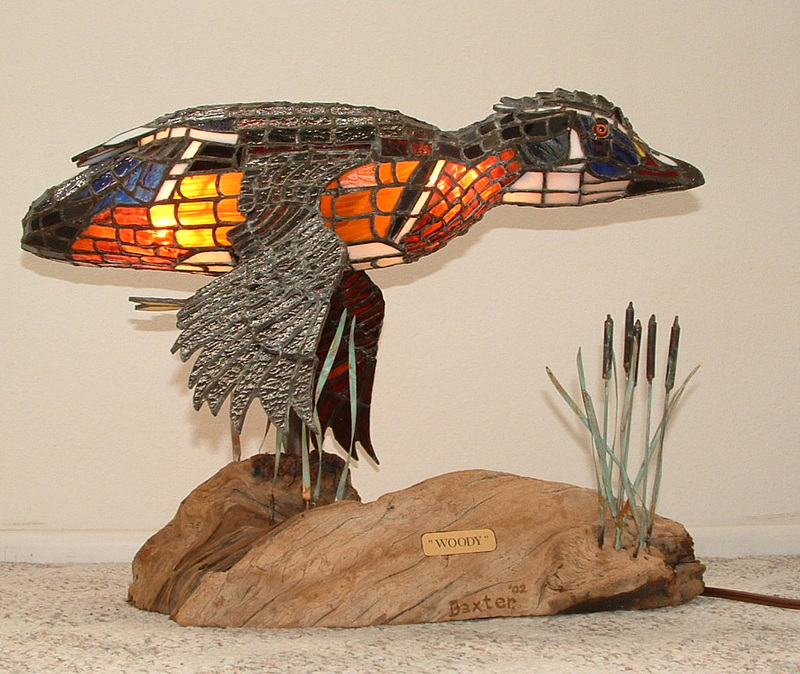 - "Woody", stained glass lamp sculpture. Woody stands 18" tall and is 24" long. sculpture. Harry stands 3' tall and the sculpture is 5' long. 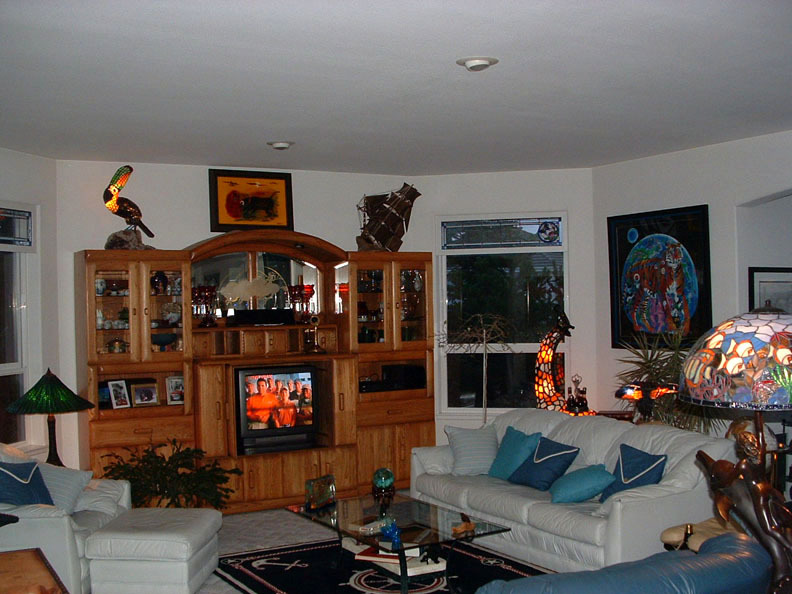 "OZZY THE OCTOPUS" - A WORK IN PROGRESS - INTERIOR VIEW OF OUR LIVING ROOM WITH VARIOUS LAMP SCULPTURES LIT UP. 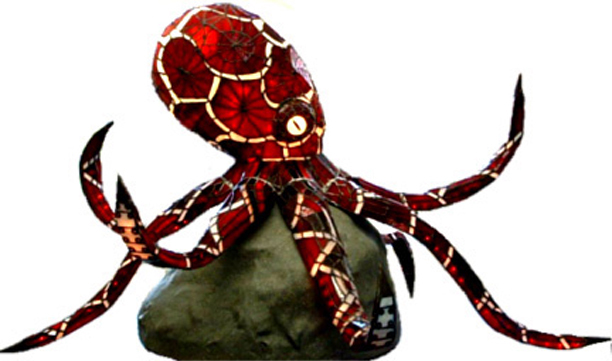 "OZZY THE OCTOPUS", leaded stained glass lamp sculpture. This is a picture description of how a stained glass sculpture is constructed. When completed, Ozzy will have approximately 2500 hours of time spent in his construction. 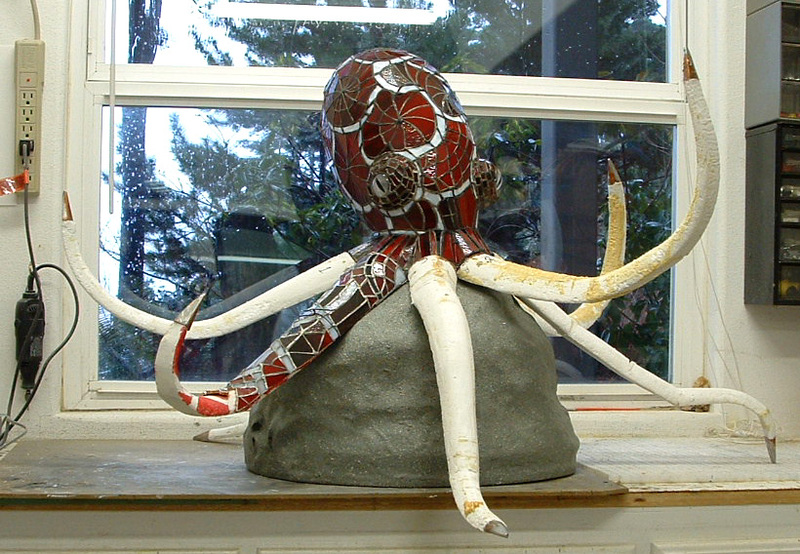 Ozzy was sculpted out of styrofoam and the pieces of leaded glass were soldered individually onto the sculpted form. 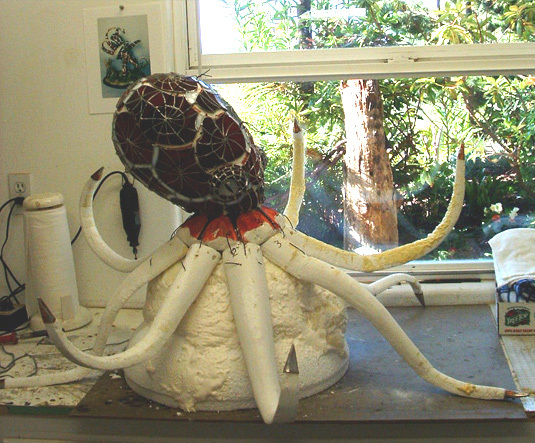 As you can see, most of the tentacles are still in the styrofoam state. The styrofoam is removed after the leaded glass is completely soldered to the form. 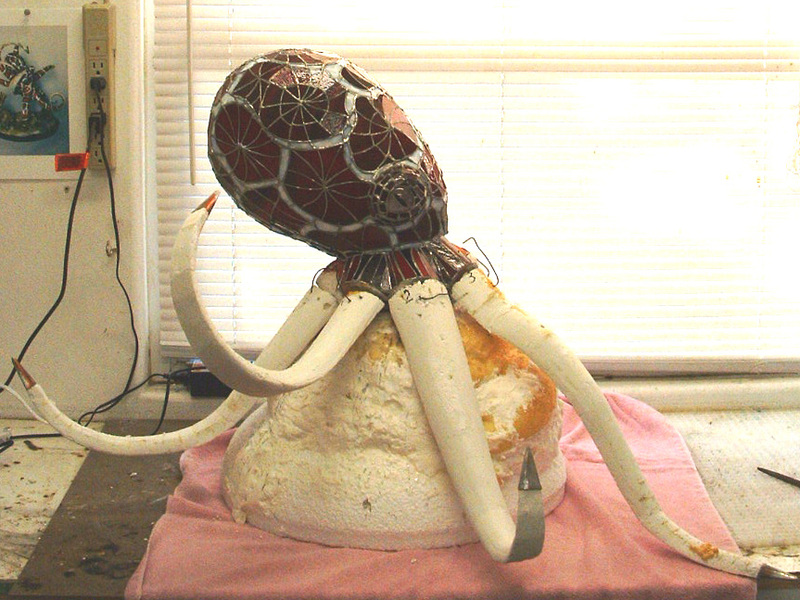 The lighted portion of the lamp is wired after the sculpture is completed. Ozzy has an access door on the backside to facilitate the wiring and rare changing of light bulbs. Heat generated by the lights would generally be a problem, but with the advent of energy saving fluoresent bulbs and rope lighting, the sculpture remains amazingly cool even after long hours of operation. The tentacles will be lit by the rope lights running down each tentacle. Fuse blocks are situated inside the body and each tentacle as well as the body lights have their own fused circuitry. When lit, Ozzy has an ethereal burgundy glow. Ozzy can be displayed indoors or outdoors. Ozzy is 3 feet tall and about 4 feet in circumference. He will weigh in at about 60 pounds, and have approximately 3000 individual pieces of glass. 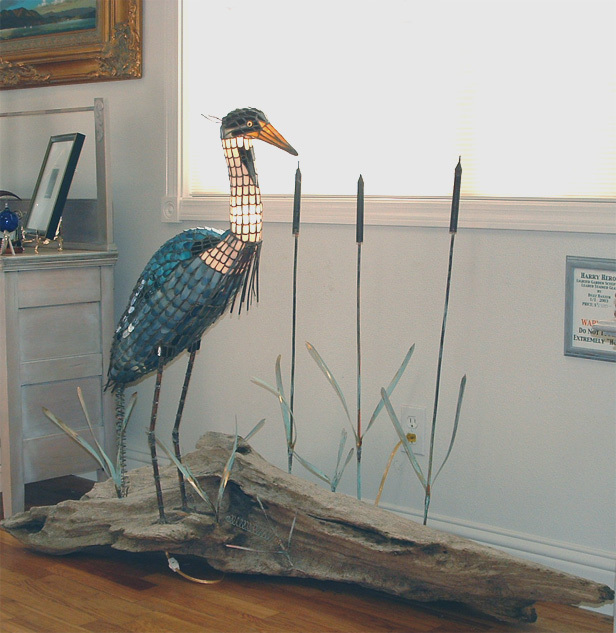 Eyes for the leaded glass sculptures are purchased through a taxidermy supply house. 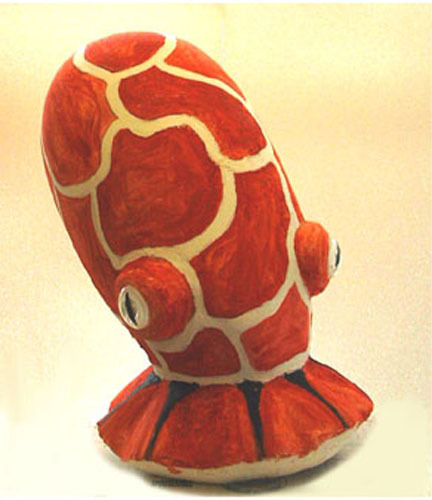 The sculpted bodies of the animals are stylized interpretations of the artist, Buzz Baxter. 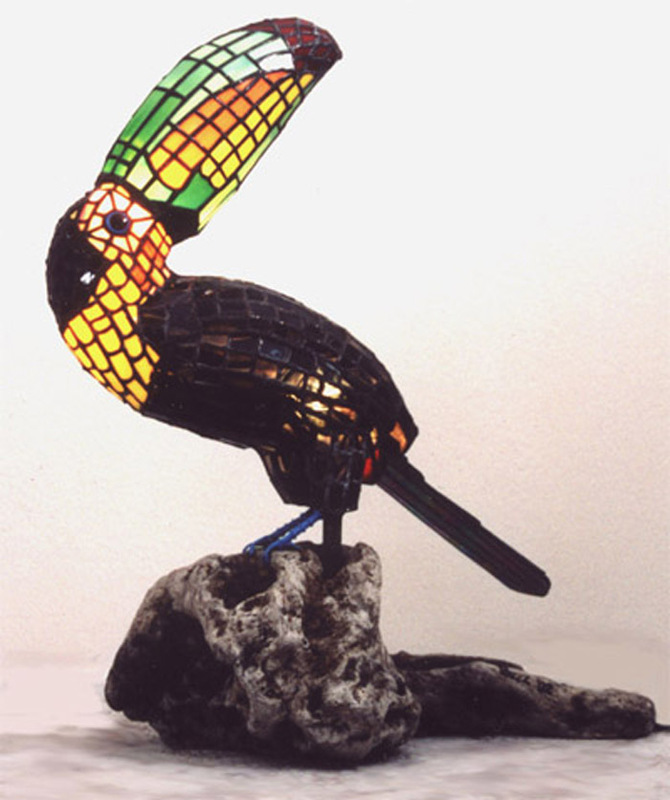 Buzz is one of only a handful of artists who specialize in fully three dimensional (fully enclosed) animal lamps of leaded stained glass.